The holiday season is fast approaching, and if your company hasn’t already, now is the time to be making arrangements for your company holiday party. As the years pass, we are seeing fewer companies host holiday parties for their employees for a variety of reasons: the holidays are busy, parties are expensive, you aren’t sure if employees will attend and many others. However, company holiday parties can be a great way to give back to your employees, show your appreciation for their hard work and allow them some time to socialize and have fun with one another as your work year comes to a close. If you’re on the fence about hosting a company holiday party, here are a few reasons why you should! They’re fun: Simply put, the main reason why companies should host a holiday party is because they’re a lot of fun! Employees almost always enjoy getting dressed up and having a good time on the dance floor or sharing a meal with colleagues outside of a work environment. The party is all what you make of it, so if you put on a great time, they’re more likely to have one! Boost morale: Parties are also a great way to boost company morale as you head into the new year. Remind your employees why they love working for your company and how much fun your company culture can be by giving them the opportunity to have fun and enjoy the holiday season. Socializing: Holiday parties help colleagues who don’t know each other very well to talk and get to know one another better. Many employees only interact with the people in their department on a day-to-day basis, so a holiday party can help connect your employees in a more social environment. This can not only lead to lasting friendships for your employees, but also a better, more connected work environment. Give back: One of the best ways to show your appreciation for your employees is to give them a gift, and what better gift than a fun night with work friends, food and maybe even prizes? Throwing a holiday party for your company can help show that you appreciate all of the employees’ hard work and dedication to your mission. Are you convinced? Good! Now it’s time to plan your party to make it the best one around! First, you’ll want to pick a date. Sending a company-wide survey and choosing the most popular date option gives you the best chance of having as many attendees as possible. This also helps you get a rough head count for budgeting purposes. Once you choose a date, remember to communicate it and all future party plans to your company! Next, you’ll want to set a budget, choose a party venue in Northwest Indiana and decide what type of party you’d like to throw. Do you want it to be black tie, semi-formal, casual or themed? Next, choose decorations, food and drinks that are appropriate for your type of party. You can match these to your company culture, too—a more sophisticated company might hold a black tie event with sleek decorations, while a more laid back company might host a silly theme party! Finally, decide if you’ll offer any extras like raffles, speeches, prizes or awards and get those in order with plenty of time to spare before your party. Double check with your party venue in Northwest Indiana to make sure everything is ready to go for your event. 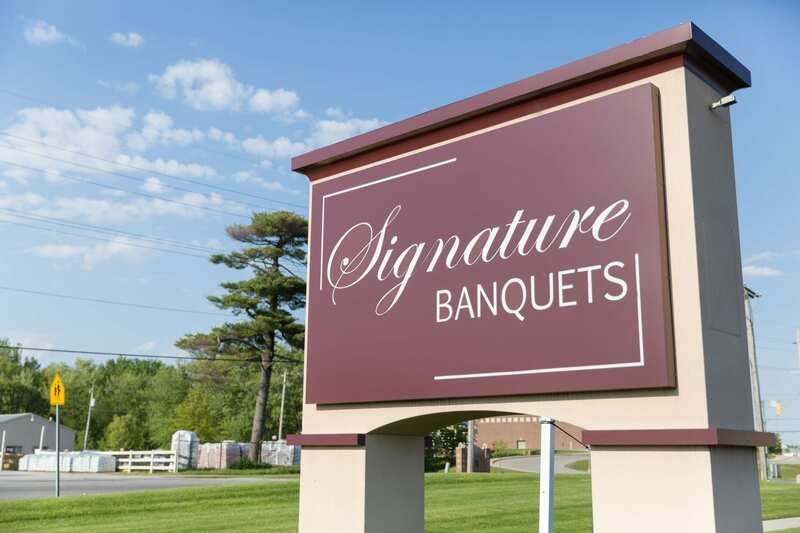 If you need the perfect party venue in Northwest Indiana for your holiday party, contact Signature Banquets. We are a first-class facility with a 9,000 square foot banquet hall perfect for your next company event. Our in-house catering services and excellent customer service make party planning a breeze, so call today to make a reservation!